We are truly thankful to have found so many bloggy friends this past year. We just turned 1 yesterday, by the way. I know I'm not so keen in dates so I would like to thank everybody who has visited us and made us part of their virtual lives. Oops! Sorry, these Doggyman Milk and Bacon flavored and Cheese biscuits are decommissioned. 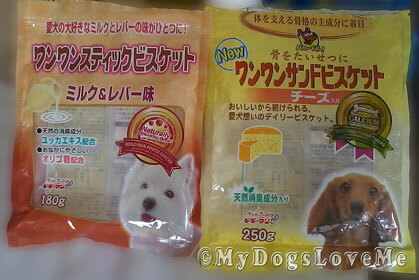 Our personal favorite is the Veggie flavored Doggy Biscuits from Doggyman. 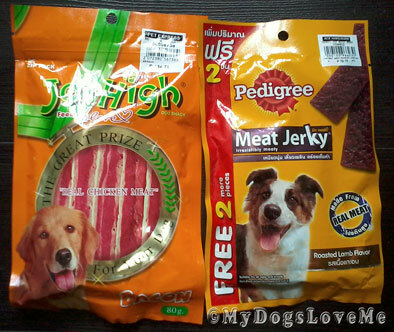 Here are some Jerhigh and Pedigree Meat Jerky. You can pass it around but don't forget to drink lots of water because of the sodium content. If this isn't enough, perhaps the next one would suffice. Our supermarket actually has a frozen Dog Food section. We can boil a few scrap bones and everybody could enjoy fat juicy bones for snack time. Once again, thank you for being part of our lives. Congrats on the BIG #1!!!! And thanks for sharing all those yummy treats. We are all drooling. Your *supermarket* has a frozen dog food section? Are you serious? That's fantastic! 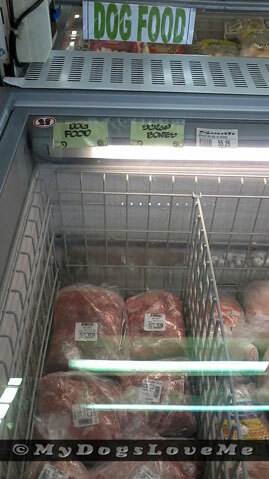 Only a couple of stores here even carry raw for dogs and cats. I don't feed it, though do think it's the best diet. Concats on your 1st Blogoversary, by the way! Happy happy first birthday!!!! I can't believe the selection of your supermarket!! Happy first anniversary. Have a terrific Thursday and go celebrate. Happy one year anniversary! We have enjoyed being one of your bloggy friends!!!!! Oh My, a market that sells doggie bones with meat, how great is that. Happy First Barkday. heres also a big Thank you for coming to Blogville and sharing with us!!! Congrats on making it to your one year blogiversary!! They decommissioned Bacon, Cheese and Milk....scandalous! The other treats are excellent. MOWZERS! COncats on #1!! Your blog is exactly half as old as we boyz are! MOL!! Congrats on the huge milestone! I want to go to your supermarket. Looks yummy. Congratulations! Indy and Bogey say "thanks" for the virtual treats! Congratulations on your 1 year blogiversary! May you have many years to come. Yay! Happy one year blogiversary! That is a great achievement, and I am so furry happy to have been a part of it. You have been great bloggy friends and I look forward to the next year of your adventures. Thank you for the super yummy treats. I can't stop drooling at the frozen section. I wish our grocery store had that! Very cool, and I can imagine how your dogs must love them.